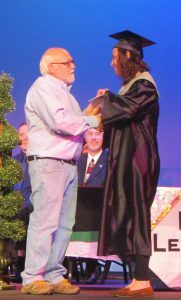 $6500 in Scholarships – We offer one $2000 scholarship to a student from East Burke High and one $2000 scholarship to a student from Draughn High School. In addition, the Club will offer a $500 non-traditional scholarship for a student already attending college. For Hallyburton Academy Students, we offer 4 $500 scholarships (2 each graduating period). Hallyburton Academy – Provide money and teachers for Music Class, Art Program and Financial Security Classes. Host First Friday Breakfast for students with professionals from the community speaking. Sponsor an Interact Club. Help with Spring Fling Cookout each year. $750 for Books – Raised $500 from club members and club funds, and $250 was donated from the Valdese Merchants Association. That is $750 that will be spent on books for the 3rd graders required to attend summer school for books to take home with them. Should be about 3 books per student. Meals on Wheels – Rotarians rotate to cover the Wednesday shift. $200 for Books – Sent to a primary school in Guatemala that is supported by the Presbyterian Church and a local Rotary Club. 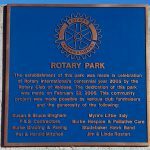 Parks – In 2005, our club created Rotary Park located at the tennis courts on Carolina Street. In 2017, our club has pledged $7500 for park amenities at the Valdese Lakeside Park. Water Project in Africa – Researching at this time. School Service Clubs – Sponsor Interact Clubs at Heritage Middle, East Burke High and Hallyburton Academy. Sponsor RotoKids at Valdese Elem. Citizenship Awards – For DHS, Rotary will sponsor the Worthy Wildcat Awards every 9 weeks – a student determined by each department who exhibits excellence in character and in service using the Four Way Test of Rotary. Award will be presented at a Rotary Lunch meeting. Same for HMS – except a boy and girl chosen by teachers from each grade. 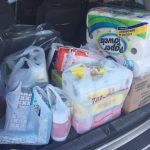 Options – Collected paper products for Options in Morganton – provides advocacy and support to victims of domestic and sexual violence. Spring Leadership Camp – Send 4 rising high school students to camp for 4 days. 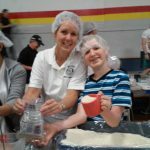 Stop Hunger Now – Food packaging – Raised $10,210.32 for 35,208 meals at .29 cents each – packaged in April with over 100 volunteers. Teacher Training – Sent 3 teachers (VES, RCES, HA) to several days of Orton-Gillingham training in Charlotte. Teaches methods of reading instruction for kids who cannot learn in a traditional manner. CART – Coins for Alzheimer’s Research Trust – Hosted an event at Grace Ridge in October, 2016 to raise awareness of Alzheimer’s. Collect money each week for the fund. 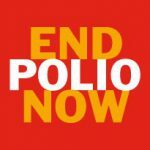 Polio – Rotary, along with our partners, has reduced polio cases by 99.9 percent worldwide since our first project to vaccinate children in the Philippines in 1979.